Heat oil in a medium saucepan over medium. Cook onion, stirring often, until softened and golden brown, 8–10 minutes. Add garlic, ginger, curry powder, and red pepper flakes and cook, stirring, until fragrant, about 2 minutes. Add lentils and cook, stirring, 1 minute. Add Crushed Tomatoes, ½ cup cilantro, a generous pinch of salt, and 2½ cups water; season with pepper. Set aside ¼ cup coconut milk for serving and add remaining coconut milk to saucepan. Bring mixture to a boil; reduce heat and simmer gently, stirring occasionally, until lentils are soft but not mushy, 20–25 minutes. Season soup with more salt and pepper if needed. To serve, divide soup among bowls. 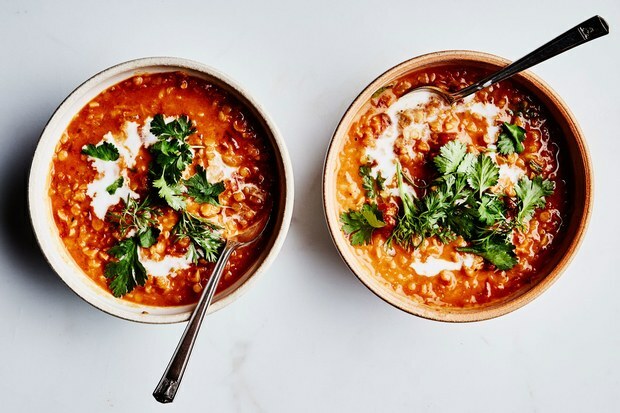 Drizzle with reserved coconut milk and top with more fresh cilantro. Serve with lime wedges.